I do enjoy a good side-scrolling experience especially if it happens to involve guns, swords or just swinging your fists like a maniac. Classics like Streets of Rage II and Gunstar Heroes immediately spring to mind, two games that for me have stood the test of time and call me back every now and again for one more playthrough. Then there are the more recent takes on the side-scrolling fighter and shooter genres – games like Castle Crashers with its satisfying levelling system or Gunman Clive and its sketchy (literally) visual style. Both have managed to deliver that same satisfying arcade-like experience I remember so fondly from my childhood in newer and often interesting ways. Enter Guns, Gore and Cannoli, another run-and-gun experience only this time with a particularly unique twist – it combines zombies and gangsters. Set in the 1920s, you play as an enforcer for the mob, Vinnie Cannoli. Thugtown is your playground and unfortunately, it’s a city overrun with zombies, other gang members, thugs and giant rats. Literally giant rats. Guns, Gore and Cannoli is easily one of the more story-heavy run-and-gun games out there and while that would be a neat claim, unfortunately, it’s all so forgettable and often times painfully voiced. Thankfully the gameplay fares somewhat better, delivering an easy to grasp, bloody offering that takes you through streets, ships, rooftops and even sewers. All of these locations are impressively illustrated with a neat hand-drawn style that gives the world a great sense of character. Light on platforming and heavy on shooting though, these environments while cool to look at play second fiddle to the constant dispatching of swarms of zombies and other baddies. While early enemies might pose little threat, the deeper into the game you get the tougher they become sporting their own firearms, explosives and even shields. Handling Vinnie feels solid enough, the controls allowing you to perform a basic repertoire of moves – jumping, crouching and firing your weapons. Unlike other games of this genre though where you’re free to spray bullets in all directions be it up, down or diagonal, shooting is oddly restricted to just a horizontal plane here. That means there are plenty of situations where you’re jumping and firing in mid-air to try and nab a headshot or crouching to take out lower placed enemies. It certainly feels like a step backwards, not being able to simply aim diagonally at awkwardly positioned foes especially when games have included this sort of thing for years. It might take some getting used to and doesn’t ruin the game per say, but it does make Vinnie at times more cumbersome to manoeuvre than it should be. Your guns range from the simple single shot pistol to machine guns and shotguns, each with their own perks and weaknesses. For example, while shotguns will often despatch the simpler enemies with ease thanks to its messy spread of pellets, it lacks effectiveness when dealing with the human billboards. Switching between your arsenal and managing your ammo is a fun mini-task in itself and encourages variety in your attack. Furthermore, all of this is handled surprisingly well with the left shoulder buttons acting as your grenade and Molotov lobber, right shoulders firing and reloading and X and Y buttons your means to change weapons. Even in the midst of all the action, I had little trouble juggling weapons and killing approaching enemies. And all of this makes for a strong opening half hour or so – blasting away at gross-looking zombies and testing out the game’s arsenal. Unfortunately, this initial shine soon starts to wear off, almost as if the game has revealed its hand too early. While the gameplay is by no means bad, things do start to grow repetitive as you find yourself repeating the same actions over and over on the same enemies over and over. Suddenly the hook of mixing zombies, government officials and gangsters has lost its edge. Despite the game’s short length of around three or so hours, I found myself wanting to take breaks after burning out on the excessive and now unsurprising gunplay. I’d return only for the same to happen again after ten or fifteen more minutes. There were moments of fun still there but this feeling had dulled the deeper into the adventure I got. It’s not until you include more players where the game starts to show signs of life again. Up to three others can join in the fun locally and while the action can become a little too chaotic on screen at times (especially in handheld), multiplayer is definitely the better way to experience Guns, Gore and Cannoli. Guns, Gore and Cannoli is a solid take on the run-and-gun genre. 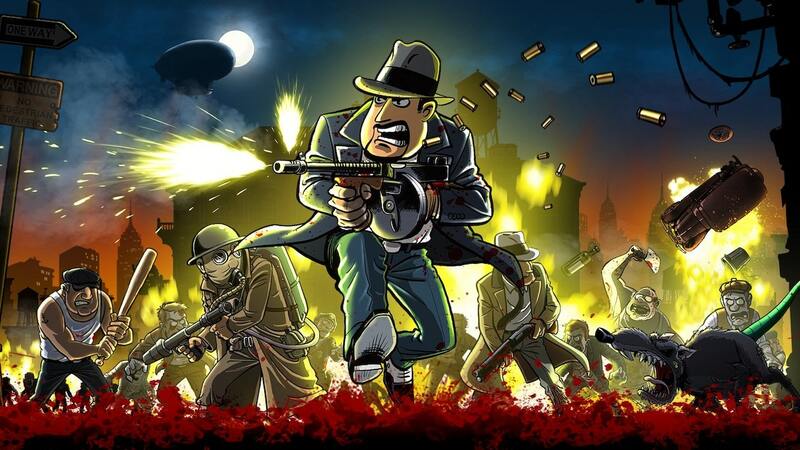 While its unique combination of zombies and gangsters is impressively illustrated through its detailed and eye-catching visuals, sadly the gameplay doesn’t feel as special. It might start out on a strong opening note, but slowly falls prone to repetition and like an infected, shambling zombie, the experience starts to rot a little the longer it’s around.